Male rhinoplasty is a specific and unique procedure. About one million cosmetic surgeries are performed on men each year, and male rhinoplasty is one of the top five procedures selected. It consists of reshaping and adjusting the structures of the nose for a more balanced and pleasing result. 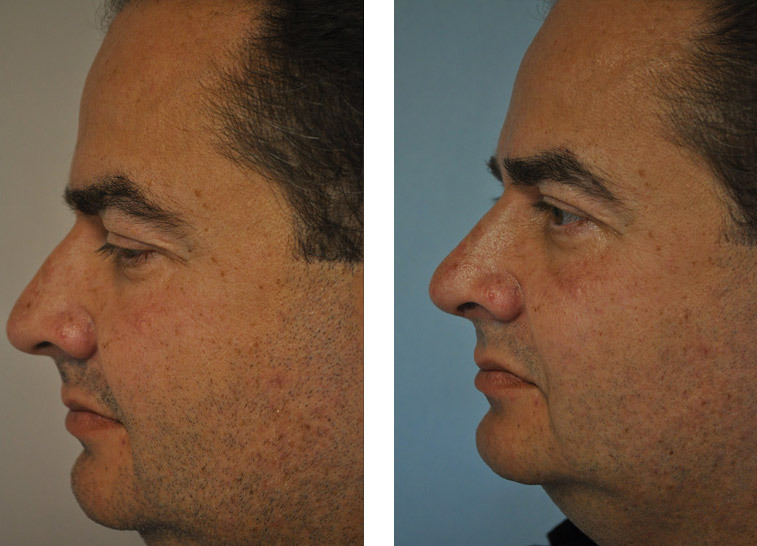 What types of changes can be made with a male rhinoplasty? It is essential that the masculinity of the nose be kept intact during a male rhinoplasty procedure. Because many plastic surgeons do primarily female nose surgery and plastic surgery, male rhinoplasties performed by a less experienced surgeon can result in a nose that is overly “done” or feminine looking. Dr. Aminpour is a double board certified rhinoplasty surgeon in Los Angeles with extensive experience focused directly on nasal surgeries. His skill in both primary and reconstructive surgeries and in ethnic and male rhinoplasty, performed in his Los Angeles office, brings some of the top skill in nose surgery to the table with every patient. Generally, male noses are larger than female noses. Even if you would like to refine the size of your nose or reduce the shape in some way, it is essential the nose is not reduced too far and made too small. Dr. Aminpour is excellent at accomplishing a masculine, handsome result for his patients. It is not uncommon for men to sustain some type of trauma to the nose during physical activity or athletics. This may or may not affect both the breathing and the appearance of the nose. As a facial plastics specialist, Dr. Aminpour can address both the functional and cosmetic aspects of the nose during one surgery. Whether you have a deviated septum or some other injury or functional issue, Dr. Aminpour is proficient in improving one's breathing and airflow through the nose. If a patient is considering cosmetic changes to the shape and size of his nose, this can also be accomplished during the same surgery. This avoids two administrations of anesthesia and two recovery periods. Within these galleries, you will find many examples of how Dr. Aminpour routinely delivers among the highest standards of facial plastic and reconstructive care. Each ethnicity possesses its own distinctive nasal traits. It is of vital importance to consider the heritage of each patient to preserve their ethnic legacy and features. At the same time, the face of each patient is unique and will contain a combination of features and characteristics that must be taken into consideration when planning a nose surgery. Dr. Aminpour will consult you first on your goals for your personal appearance, which is the most important thing. He gives you an idea of what can be accomplished so your expectations are realistic. He also addresses the methods that can be used to preserve your ethnicity and balance your facial features in the most aesthetic and pleasing arrangement. Whether you are of African-American, Persian, Armenian, Arab, Asian, Latin, Caucasian or mixed descent, Dr. Aminpour can ensure a natural, aesthetic result that reflects your personal identity. What types of changes can be made? Schedule a free consultation with Dr. Aminpour today to discuss your options and view potential outcomes with 3D imaging technology. During this time, you will learn exactly how male rhinoplasty applies to your specific circumstances, gaining an understanding of why Dr. Aminpour's delivers among the best male rhinoplasty Los Angeles has available. In addition, check out more about rhinoplasty in Los Angeles to learn more about the procedure.